Bella can hardly believe what New York City is like. It is such a noisy place and so unlike the village in Italy where she grew up and where her family is still living. She misses her family terribly and the only thing that keeps her going is knowing that they are depending on her to send money to them. Without her help they will starve, and so she must find a job quickly and work hard for their sakes. Soon enough Bella is snipping threads off shirtwaists at the Triangle Shirtwaist factory. She cannot understand what is being said to her most of the time and she is terrified of making a mistake so she keeps her head down and works hard. There are other girls in the factory who have more to say however. Yetta and her sister Rahel have been around for longer and they know their way around the factory. They also know that they are being taken advantage of and they are very angry about it. The sisters are determined that something should be done to improve the working conditions in the factory. The workers should have a union to protect their rights. They should be paid fairly and work a reasonable number of hours. They should also be assured that the place where they work is safe. Bella has not been working at the factory long before a strike is called. Yetta and Rahel are deeply involved and Yetta is often beaten by the police and arrested for walking the picket lines. Bella, not understanding what is going on, keeps on working. She is desperate to make money to send home to Italy and she does not know what the strike means. Meanwhile a poor little rich girl, Jane, discovers that there is a whole world beyond the dances and tea parties that she is expected to go to. It all begins when she meets some college girls who take her to the Triangle Shirtwaist strike. The girls want to offer their support to the strikers and Jane comes to realize that there is so much more to life than the shallow existence she has always accepted as her lot. For the first time she sees injustice and she is appalled by what she sees. She even goes so far as to try to help and she tries to talk to her father about the plight of the shirtwaist factory workers. When she finds out that he is to blame for similar atrocities, Jane runs away from home and she ends up living with Yetta and Bella. The three girls become the best of friends, hoping and working for a better future, and struggling with poverty and grinding hard work in the meantime. 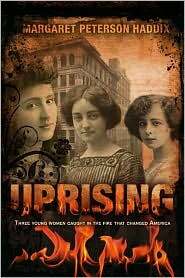 Then, on March 25th, 1911 all three girls are in the Triangle building when a fire breaks out. It is a fire which will change their lives forever and which will break the heart of one of them in an unimaginable way. In this remarkable book the author explores a number of fascinating topics. She looks at what it was like to be a new immigrant in New York City at the turn of the century; she shows her readers what working conditions were like at this time for the working poor; she looks at what it was like to be a woman who had little control over her future; and she tells the story of the famous Triangle Shirtwaist fire. Through the eyes of Yetta, Bella, and Jane we are able to see that young women in the early 1900’s had so few choices open to them. If they were poor they could work in a factory, sweatshop, store, or as a governess or teacher. If they were rich they were expected to look pretty and get accomplished in readiness for marriage. Rich or poor, girls and women were expected to marry the person chosen for them by their families. A young woman had to be very brave to try to break free of these constraints. Superbly written and carefully researched, this is a title which serves as a marvelous tribute to all the young women who fought so bravely for the vote, for unions, and for their freedom.